How to Interpret Numeric Results in Publications? Massive amounts of new literature are published each year, providing varied levels of evidence to the medical urology community. Despite the peer-review processes in place with most journals and congresses and in spite of the widespread adoption of international reporting guidelines such as CONSORT, the new evidence is unfortunately not always objectively and unbiasedly presented. Intentional or more often, unintentional misuse or misinterpretation of statistical evidence, inadequate trial methodology, the natural tendency of humans to seek confirmation of their prior beliefs and to give more focus to the more statistically significant findings are the most common flaws in the medical literature. In this chapter, we will illustrate some of these pitfalls, with the aim to exercise the reader to using their critical thinking when appraising published research findings. 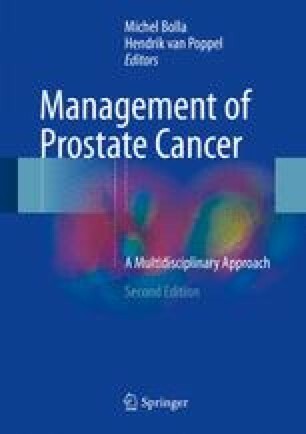 We will use published reports comparing therapeutic interventions against prostate cancer as examples because modern clinical trials are becoming increasingly complex and therefore more difficult to appraise for the non-statistically trained reader. European Medicines Agency. Guideline on the investigation of subgroups in confirmatory clinical trials. EMA/CHMP/539146/2013. 2014. Available at: http://www.ema.europa.eu/docs/en_GB/document_library/Scientific_guideline/2014/02/WC500160523.pdf. Accessed 19 Apr 2016. European Medicines Agency. Points to consider on multiplicity issues in clinical trials. CPMP/EWP/908/99. 2002. Available at: http://www.ema.europa.eu/docs/en_GB/document_library/Scientific_guideline/2009/09/WC500003640.pdf. Accessed 19 Apr 2016. European Union. Regulation (EU) 536/2014 of the European Parliament and of the Council of 16 April 2014 on clinical trials on medicinal products for human use, and repealing Directive 2001/20/EC. Available at: http://ec.europa.eu/health/files/eudralex/vol-1/reg_2014_536/reg_2014_536_en.pdf. Accessed 19 Apr 2016. OCEBM Levels of Evidence Working Group*. “The oxford 2011 levels of evidence”. Oxford centre for evidence-based medicine. http://www.cebm.net/index.aspx?o=5653. Last Accessed 19 Apr 2016. * OCEBM Table of Evidence Working Group = Jeremy Howick, Iain Chalmers (James Lind Library), Paul Glasziou, Trish Greenhalgh, Carl Heneghan, Alessandro Liberati, Ivan Moschetti, Bob Phillips, Hazel Thornton, Olive Goddard and Mary Hodgkinson. U.S. Department of Health and Human Services Food and Drug Administration. Guidance for industry clinical trial endpoints for the approval of cancer drugs and biologics. 2007. Available at: http://www.fda.gov/downloads/Drugs/Guidances/ucm071590.pdf. Accessed 19 Apr 2016.